Just found what looks to be a major new paper in nature climate change showing slow down in the Atlantic meridional overturning circulation (AMOC, also known as the gult stream etc), and also showing thisis unprecedented in the last 1000 years. PS please move to another section if needed Neven, wasn't sure where this belongs! Greg Laden has a blog post on it. The video at the bottom intercuts scientists from today and clips from the disaster movie, "The Day After Tomorrow." Here's another place where it is being discussed. First, the following link may lead to a complimentary copy of article by the Washington Post. Second, I attach the first & second figures from the article (see the caption for the first figure at end of the post). Finally, I would like to point-out that the formation of Antarctic Bottom Water, AABW, also contributes to the speed of the AMOC and the rate of production of AABW has slowed in recent years; so the exceptional slow-down of the AMOC (which naturally oscillates) may not be exclusively due to ice melting from Greenland. circles) of the subpolar-gyre region for which time series are shown in Figs 3 and 5, as well as the model-average 2◦C cooling contour (white) from a climate model intercomparison in which the models were subject to a strong AMOC reduction induced by adding a freshwater anomaly to the northern Atlantic. The geographic extent of the model-predicted temperature response to an AMOC reduction coincides well with the region of observed twentieth-century cooling. The models are forced more strongly and cooling extends further west as a result of shutting down Labrador Sea convection, which has only briefly happened in the real world so far. (Note that the second cooling patch in central Africa is in a region of poor data coverage and may be an artifact of data inhomogeneities.)" This certainly is news to watch. I've been pondering it over and over while analyzing the means at hand. "I have spent hours doing NCEP/NCAR reanalysis correlations on Skin Surface Temps and so on. The idea was to look for clues whether the characteristics of the last two Arctic seasons could tell me anything in context to abrupt change in the form of a Heinrich-/D-O Event? I had the GIS-melt 2012 in mind, though a 500+ Gt loss is small compared to the massive meltwaterpulses that have ended the Weichselien. The loss is even small compared to the yearly freshening in the Arctic Ocean through melt and rivers. " "The geomorphology in the Arctic is very different. Feedbacks possibly contributing to a temporary stage in the Arctic are not comparable to those at work around Antarctica. What could be at work, though, is a change in the Overturning Circulation. It could at the same time contribute to grounding line retreat of Antarctic ice shelves and sea-ending glaciers as well as affect winter and summer atmospheric pressure configuration over the Arctic." I would be really surprised if my layman's fear would be confirmed through scientific research. I'm already inclined to be convinced. The strong ridging over the far N Atlantic last summer. SST's in the Barentsz Sea lowest in 10-14 years, it would all be in line with this news. Even a comparatively small GIS-meltwater contribution could be in excess in an already vulnerable system. Doing a quick and dirty google search, a couple of articles catch my eye. Could this mean we are in a permanent state or a reoccuring state that will become longer and more frequent? Although this article downplays the possibility of it happening it does give possible outcomes if it does. Kudos to Washington Post with a well written report. If you read what was said by the three major authors is that the models say it would not happen. Their conclusion is that (can not find exact quote), either models do not account for how sensitive AMOC is, or have not accounted for how much fresh water Greenland is pouring into the ocean, or a combination of the two. In any case the data says the models have got it very wrong on the conservative side. As Dr. Allen has said (who tends to be conservative) "we do not know what the slope will be, the problem is that all the questionable results are the extreme upslope." In other words Global warming is not in question it is all on how fast and how bad, and all the questioning is about how very bad and how very fast it will be. Not on how little the effects will be. Seems another case that the most optimistic are having a problem selling their said because the data is telling a worse and worse story. @docfreeride: Having lots of journalists in my feed means I read [the above tweet] & thought, "Why is @MichaelEMann tweeting about magazines?" @docfreeride: . @MichaelEMann @TheAtlantic There's "old media" and then there's OLD media! BTW It will not mean ocean currents will come to a standstill as the spin of the earth will still force water to move around, it just will mean they could be radically different then they have been historically. That in turn will mean that traditional weather patterns will also be greatly affected. The consensus seems to be that this is to do with Greenland melt, what I would like ruled out is that this is actually caused by the freshest arctic water, from siberian rivers the pacific or melt, escaping from the arctic through the archipelago/nares. This is what I would expect if we have low density ice floating high in the ocean not inhibiting the flow of water beneath. Thanks for opening this topic, RoS, but I'll move it to the Consequences Category if that's okay, as this doesn't really have that much to do with Arctic sea ice. So how worrisome is this? For now, most scientists remain confident we won't see a sudden shutdown anytime soon. Mainstream climate models have long predicted that the AMOC would eventually weaken as the Earth warms, but those models don't forecast huge, abrupt changes this century. Early stages maybe, but now highly unlikely. Location of cold spot and currents around Greenland give a pretty close match. The question that comes to my mind is: Is the AMOC that sensitive to fresh water, or are we underestimating how much melt is going on in Greenland? Stefan Rahmstorf has issued a follow up blog on RealCimate exploring the possible links between the slow down in the AMOC and the recent Polar Vortex in NE USA. The past winter was globally the warmest on record. At the same time it set a new cold record in the subpolar North Atlantic – and it was very cold in the eastern parts of North America. Are these things related? He is placing the cart before the horse on that one. Aerosol forcing has yielded similar north pacific blocking patterns. Those, in and of themselves, are enough to establish a standing rossby wave pattern that would produce an offshore cooling in the north atlantic. Rahmstorf, Stefan, et al. "Exceptional twentieth-century slowdown in Atlantic Ocean overturning circulation." Nature Climate Change (2015). 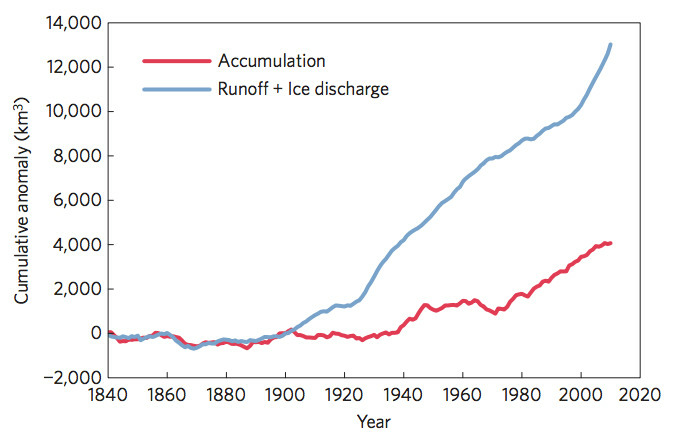 O/T Anyone who does not believe in the hockey stick has a problem. Every study I have seen in regards to climate change has that sharp dangerous curve no matter what the topic is. Okay then, two Giants when it comes to Winter ice: Jean Béliveau, and MM. Nonetheless, and in our Arena, the Hockey Stick Lives. While bidecadal climate variability has been evidenced in several North Atlantic paleoclimate records, its drivers remain poorly understood. Here we show that the subset of CMIP5 historical climate simulations that produce such bidecadal variability exhibits a robust synchronization, with a maximum in Atlantic Meridional Overturning Circulation (AMOC) 15 years after the 1963 Agung eruption. The mechanisms at play involve salinity advection from the Arctic and explain the timing of Great Salinity Anomalies observed in the 1970s and the 1990s. Simulations, as well as Greenland and Iceland paleoclimate records, indicate that coherent bidecadal cycles were excited following five Agung-like volcanic eruptions of the last millennium. Climate simulations and a conceptual model reveal that destructive interference caused by the Pinatubo 1991 eruption may have damped the observed decreasing trend of the AMOC in the 2000s. Our results imply a long-lasting climatic impact and predictability following the next Agung-like eruption. Evidence from palaeoclimatology suggests that abrupt Northern Hemisphere cold events are linked to weakening of the Atlantic Meridional Overturning Circulation (AMOC)1, potentially by excess inputs of fresh water2. But these insights—often derived from model runs under preindustrial conditions—may not apply to the modern era with our rapid emissions of greenhouse gases. If they do, then a weakened AMOC, as in 1975–1998, should have led to Northern Hemisphere cooling. Here we show that, instead, the AMOC minimum was a period of rapid surface warming. More generally, in the presence of greenhouse-gas heating, the AMOC’s dominant role changed from transporting surface heat northwards, warming Europe and North America, to storing heat in the deeper Atlantic, buffering surface warming for the planet as a whole. During an accelerating phase from the mid-1990s to the early 2000s, the AMOC stored about half of excess heat globally, contributing to the global-warming slowdown. By contrast, since mooring observations began3–5 in 2004, the AMOC and oceanic heat uptake have weakened. Our results, based on several independent indices, show that AMOC changes since the 1940s are best explained by multidecadal variability6, rather than an anthropogenically forced trend. Leading indicators in the subpolar North Atlantic today suggest that the current AMOC decline is ending. We expect a prolonged AMOC minimum, probably lasting about two decades. If prior patterns hold, the resulting low levels of oceanic heat uptake will manifest as a period of rapid global surface warming. Thanks, need to read that one better but it makes sense after a quick browse. Any response from the authors of this paper?